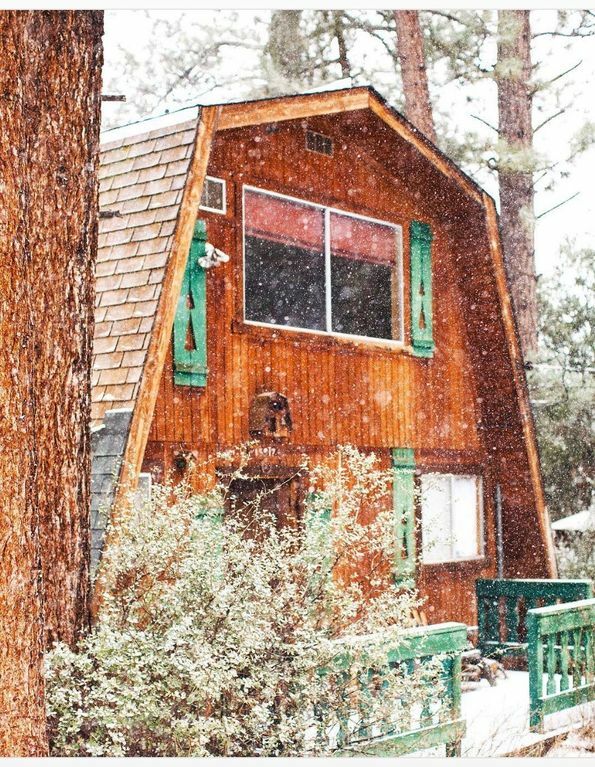 Come Enjoy the Snow and Then Cozy Up in Our Cabin! UPDATE: Watch our cabin--while you're at the cabin--in a film now streaming on Prime!! The film we spoke to you about below, Frazier Park Recut, is now available to stream for free on Amazon Prime, Google Play, and Microsoft Store!! You can watch the cabin you're staying in in an indie horror film! Very unusual and fun. Winter is spectacular in Pine Mountain Club! Please note: Holiday times may affect our one-night minimum stay; other than that, we accept one night stays. If you're unsure, please ask! Please watch our short video of the cabin that was shot by a happy guest from France. :) We are pleased to say that we are the only Pine Mountain Club listing that has earned a "Frequently Booked Badge." And, VRBO has also identified us as a "Premier Partner." We hope to continue to serve you well and always look for ways to improve. Thank you to all our guests. We've acquired the property adjacent to the cabin, a park-like space now available to our guests! It contains a horseshoe pit, including the use of horseshoes); a picnic table; many seating areas and benches; three covered benches for reading or relaxation; a wishing well; a windmill; walking paths; and decorative garden art. We hope our guests enjoy this new property and new feature of Anya's Cottage. Please contact us if you wish to rent only the outdoor space for day events. Contact us also about special events and retreats. We just hosted our very first wedding at the cabin and look forward to more! We truly believe that you will not find another cabin more lovingly decorated, each piece acquired one at a time, to complement the beauty of the mountain. Our cabin has been used by more than one film crew and for a number of club retreats. It borders the protected national forest and has a soothing, seasonal stream on the property. It is private and tucked in tall pines but is walking distance to the village where you can shop for groceries, browse for antiques, go to the local coffeehouse, dine, and listen to local music. The cabin has undergone a cleaning and an attractive renovation, which includes spa tile in the main bathroom; a rain shower head; hardwood flooring up and downstairs; a beautiful, full-sized, stove, oven, and hood; new programmable coffee maker; some new furniture and decorations; stainless steel pot and pan set; DVD player; log bed for the second bedroom (now in addition to the one in the master bedroom); IKEA twin bed and mattresses; 6 new pillows--4 down and 2 hypo-allergenic; designer down comforters; and, new fixtures in the downstairs bath. We also have some new deck furniture. But, most importantly: we finally have installed our new propane heater! And, what a difference it makes. Having gas heat in the bedroom/main bath area keeps you more toasty than most of the cabins do which tend to have electric heaters here in PMC. And, upstairs, the wood stove keeps you as warm as you'd like! Also, for our summer visitors, we have two large ceiling fans and lots of ventilation in the upstairs living area. The downstairs bedrooms stay shaded and cool all season long. This 1200+ square foot, two-story cabin has two bedrooms (one with a queen-sized log bed and a twin, the other with a full-sized log bed and a twin); a rollaway, fold-out cot; a large fold-out sleeping pad; one-and-one-half baths; is paneled in knotty pine throughout and has hardwood floors up and downstairs; and filled with authentic vintage mountain furnishings, antiques, and cozy quilts. It also has several decks where you can relax in pure solitude and privacy and enjoy the tranquil scenery. And, if you simply can't leave all of civilization behind, the cabin comes equipped with free high-speed, broadband wireless Internet access (Wifi). Be sure to visit Fern's Lake which is half a block away. Kids, bring your fishing poles! In winter, you can sled just steps behind the property. The clubhouse in the village offers many activities and amenities, including golf, an outdoor pool (from Memorial Day to Labor Day), a bistro, and a recreation room for the children. Our guests receive use of four free guest passes for their entire stay. Mount Abel (Cerro Noroeste) and Mount Pinos (over 8000 feet) are nearby. Pine Mountain Club also offers a number of festivals throughout the year. The cabin sits at 5400 feet, so come and enjoy the snow in the winter, the bright blue skies and sunshine in the spring and summer, and the colors in autumn. You will not be disappointed. I keep my calendar current. FOR FASTEST RESPONSE, EMAIL YOUR REQUEST, or text me. Thanks! Our cabin backs up to the protected National Forest. Two large ceiling fans that keep things very cool on hot days. Pillows, blankets, comforters, and quilts provided. Guests bring towels, sheets, and pillow cases. Keeps the entire top floor toasty! Basics, like salt, pepper, oil, tea, etc. Some CD's of classical, R&B, etc. It is a two-story cabin with no elevator. Complimentary Toiletries, Free High-Speed Wireless Internet Access, Free Guest Passes to Clubhouse, Wood-Burning Stove, Propane Gas Heat, Laminate Hardwood Floors on Both Levels, Attractive Window Treatments and Rugs, Authentic mountain vintage decor, DVD's, some CD's, Board and Other Games for Guests of All Ages, Carroms, Puzzles, Playing Cards, Books, Magazines, Fully Stocked Kitchen, Two Microwaves, 2 Coffeemakers, Full-sized Stove, Oven, Refrigerator, Garbage Disposal, Cooking Utensils and Dishes Provided, Some Linens Provided--pillows, blankets, comforters, and quilts (Renters bring sheets, pillowcases, and towels), Bathtub, Charcoal Grill (Weber BBQ), Deck Furniture, Additional Information, Check-in is at 2:00 p.m.; check-out is at noon. Beautiful location and a wonderful cabin! We stayed at this cabin with our daughters about 5 years ago and this time around was just as wonderful. Its convenient and charming. We had everything we needed and love the setting. Our girls stated its their favorite cabin. Thanks so much, Sheila, for this lovely review. And, thanks to your sweet girls! We hope you’ll come back again. You are welcome anytime. We had a fun little post-Christmas getaway at the cabin and had a great time. The adjacent lot was fun to explore. The kids loved the fun activities that were provided. Thank you we will definitely be back! Thanks so much, Kate, for your kind review. Please come back anytime! There are so many issues with this property. The surface, ie bathrooms, sinks, stove, refrigerator were satisfactorily clean and usable. Beyond that the furniture is beyond old, with a broken down sofa, broken down wing chair, multiple fragile or broken pieces of furniture. The roll away bed was in a closet where the door was off its track. We could only get the mattress out, and it was ripped, terribly old and basically thrashed. There were many lights that did not work and were due to disrepair. The pergo floor is in deplorable condition, although clean. The sliding doors barely worked. The drawers and cabinets in the kitchen had old and new evidence of rodent infestation, including a nest with dried corn in one drawer. The tv did not work until we tried many combinations of wiring. Not something most folks can handle. The front entrance and back deck were littered with debris, granted from nature, with dirt under so without a thorough sweeping would track into the house. The cleaning supplies provided were bottles with unknown labels and hand written contents, some of which you’d never know what was inside and couldn’t safely use. There were no paper towels to use to clean with and I wasn’t going to use my towels. There were several kitchen sponges with a scrubbing side that were so worn out and flat they must have been years old. There is no excuse for renting in this condition. Anyone can go to a garage sale either in Pine Mountain Club or nearby and pick up usable furniture. There are numerous dollar stores to buy cleaning supplies, decent throw rugs etc. The quaint decor was a collection of old timey things that all have seen much better days. Not a big enough perk to balance the rest. I felt so bad that my grandchildren had to get up Christmas morning to such decrepit surroundings. They were troopers but it was very compromising. We have come to PMC for 36 Christmases. We love our traditions. Our family has grown too big for all to stay in the family cabin so 3 families find rentals for the overflow. This ranks with the worst rental we’ve ever had. We know there are cabins on the rental lists and off again so I research as early as I can. I don’t wait until the last minute. We try to rent cabins we’ve rented and liked, but often they are sold or not being rented. The guest books had pages ripped out, probably the ones with scathing reviews. The on line reviews had to be made up. There is now way any real reviews made it onto the sight. Unfortunately, Ginger and Max W. seemed upset upon arrival at the cabin. They were angry that the TV cable box appeared to not be working and the guys couldn't watch football. Ginger texted me right away and told me. I apologized! I hadn't known. And, then on Christmas Eve, I called our cable company until I got someone to answer, and they told me how my guests could watch cable by bypassing the box and go directly into the TV. I was so happy for Ginger and Max! When I texted them to let them know, Ginger didn't even respond. But, after that, sadly, they were unhappy with everything--from the sponges (which are changed regularly) to the leaves which had blown in front of the door. They acknowledged that the cabin was clean and usable, yet they called our sweet little cabin "a dump." The leather sofa is in perfect condition and super comfy, and the chair is less than a year old (they sent NO pictures to show me what they were talking about). And, owners cannot write their own reviews! Only paying guests are allowed to. I could go into more detail, but I'll end with this. Ginger and Max W. stayed over Christmas Day with their grandchildren. I had asked them when they booked the cabin if they would like a Christmas tree. They said yes. So, I was thrilled to buy a real Christmas tree and have it delivered, set up, and decorated (and taken down, of course). And, it snowed on Christmas Day! So, there they were--they could have a fire, watch the snow fall with their grandkids on Christmas Day, and they were this miserable? I am sorry for them. But, because we guarantee our guests a pleasant stay, I offered them a sizeable refund. I want you to know that we take great pride in giving our guests an enjoyable getaway. And, we stand behind that. But, if you're looking for a boring, undecorated home, our cabin is not for you. We like it when kids draw pictures of the cabin and tack them to the fridge; we appreciate having so many returning guests that feel like family and leave us little treasures; we are thrilled that we've hosted our first two weddings at the cabin to two very happy couples; we are beyond excited to have had a film made at our cabin that has won at numerous film festivals; and, we are touched that a guest asked if we would mind if he hung up a picture of his beloved dog who adored the cabin and had passed . This cabin is for our family, and we would like you to become part of it. Happy New Year to all! Please write with any questions. We had a great time hiking, eating, and relaxing. Rustic, cozy, and easy to take care of. Beautiful cozy cabin in the mountains. We had a great stay at this lovely cabin, which was spacious, yet cozy and with a lot of character. Beautiful location, and a homey vibe. The owners were responsive and the whole experience was excellent. Thanks! Thanks so much for your lovely review. It means a lot to us. We're thrilled you had a good time. Please come again! Access to hiking and sledding trails from our back yard! If you rent for 6 nights, you get the 7th night free! Three-night minimum stay required only on major holidays. $50 Service/Cleaning Fee Full refund (minus a $35 cancellation fee) if reservation is cancelled 30 days prior to check-in. No cancellations for major holidays.